The least obscure and longest-lasting amphictyony was the Delphic or Great Amphictyonic League that was organized to support the greater temples of Apollo and Demeter. The League council had religious authority and the power to pronounce punishments against offenders. Punishments could range from fines to expulsion and to conduct sacred wars. The Amphictyonic League also set the rules of battle so as to protect sanctuaries and impose sentences on those who molested sanctuaries. 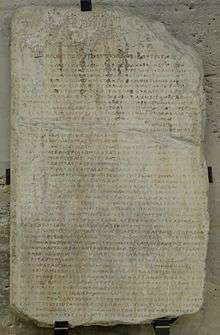 In 279 BC the Delphic Amphictyony admitted as new members the Aetolians, who had successfully defended the sanctuary as well as the rest of mainland Greece against the Gauls. At this instance the Phocians were also readmitted for having also participated at the defense of the region. In the 3rd century BC the Soteria (festival) was held in honour of the Greek victory against the Gauls. By 191 BC the League had 17 members but only the most dominant one had the two votes, when others had only one. The league continued to exist under the Roman Empire but its authority was limited to the care of the temple of Apollo at Delphi. The Roman emperor Augustus incorporated the Aenianes, Malians, Magnetians and Pythians with the Thessalians. Since the Dolopes had meanwhile vanished, he gave their vote to the city of Nicopolis. ↑ Definition. "Amphictiony". 2014. Dictionary.com. Retrieved 5 April 2014. ↑ History.com Archived April 23, 2009, at the Wayback Machine.;Encarta. Archived 2009-10-31.